We're sort of in that transitional Early Fall season when figs and prune plums are everywhere and summer still isn't entirely past us; and while I'm sad to see summer on it's way out, I'm definitely looking ahead to fall. Fall food is better, fall fashion is better, the air is crisp and the trees here in the Northeast turn beautiful shades of yellow, orange and red. Fall is hands down my favorite season. For me fall has always been synonymous with candy corn and pumpkin bread, and I've got a killer recipe for pure veg Pumpkin Spice Loaf with Maple Glaze to share in the coming week. I don't know about you but the photo above is making my mouth water. 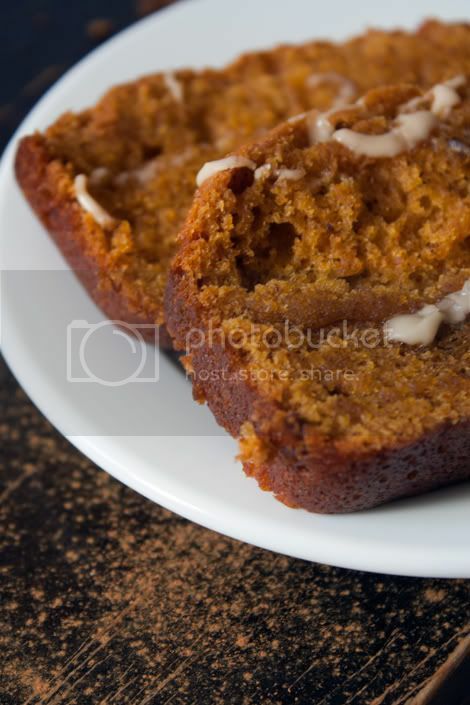 Lucky for me, I have some leftover Pumpkin Spice Loaf to dig into from this morning's photo shoot! Also coming up on The Kitch next week, a veganized recipe from the September issue of Bon Appetit: Chicken Cutlet Sandwiches with Smoked Paprika Mayo and Roasted Bell Peppers; such an easy and incredible recipe to veganize in no time. I wolfed down my first test sandwich and loved it so much that I plan to make more to pack for lunches during the workweek. And: I'll be updating you on my vegan cheese recipe test for my next Recipe Trial Group meeting (I haven't done it yet so I'm not sure if it will be like a mad science experiment gone wrong, or a recipe that turns out oh so right). Have a great weekend, and I'll catch up with you on Monday.